La Ragazza Dal Pigiama Giallo (aka The Pyjama Girl Case) was released in Italy in 1977. Based on the true story of the murder of Linda Agostini, the film follows an inspector (Ray Milland) who comes out of retirement to help the police solve the case of a murdered woman who cannot be identified and whose body is abnormally put on public display in the hopes of someone being able to recognize her. Concurrently, we also watch the events unfold in the life of the woman, known as Glenda (Dalila Di Lazzaro), and witness the problems in her life with the various men vying for her affections before her unfortunate death. 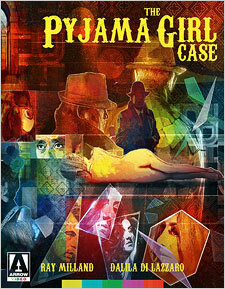 The Pyjama Girl Case is often labeled as a giallo, but I don’t really think of it as one. I consider it to be more of a tragic murder mystery story, which ultimately leaves viewers thoughtful, perhaps even sad, at the very end. It’s less about a gloved, leather-clad killer butchering women in fetishistic ways and having constant red herrings about his or her identity being tossed out and more about a woman who finds herself in terrible circumstances and unable to get beyond them. Her plight is a tragic one, but it’s also not completely one-sided. The people she associates with also have their own relatable problems, and hardly anybody is an out-and-out villain. It makes for a more realistic and interesting story, particularly towards the end when we discover what really happened to her, and who was involved with it. What also aids the film are the excellent performances from Ray Milland, but also from Di Lazzaro, both of whom are ridiculously charismatic. Di Lazzaro, in particular, sparkles and the camera absolutely loves her, and its easy to find yourself hoping for a different outcome for her. Also on display is some wonderful cinematography, as well as a couple of catchy pop songs by Amanda Lear. Featuring other performances by Mel Ferrer, Howard Ross, and Antonio Attolini, The Pyjama Girl Case is an effective and engrossing story that’s much more intriguing than a traditional giallo tale, despite being labeled as one. Arrow Video’s new Blu-ray release of The Pyjama Girl Case contains a new 2K transfer from the original 35mm camera negative, which was scanned and restored at L’Immagine Retrovata, Bologna. It’s a typical Arrow Video presentation, meaning that it’s superb in almost every respect, trumping its previous DVD presentation by a country mile. It’s rich and organic with even grain and high levels of depth and detail. The color palette is lush and varied with natural skin tones and deep blacks. The contrast is perfect, allowing for excellent shadow detail, and the overall image is bright and stable throughout. The only blemishes leftover are some mild scratches, which are not always easy to spot. The audio is included in both English and Italian 2.0 mono LPCM with two subtitle options in English SDH. Depending on which language you choose, the opening and closing titles, as well as the subtitles, will change (fans of the film will no doubt note the various differences in both). As for the quality of the two tracks, there’s no major difference between them besides the obvious. The only noticeable difference is that the Italian track is slightly louder with slightly more hiss. Otherwise, they’re fairly identical. Sync is loose on both tracks, as to be expected, but dialogue is clean and clear, albeit mostly dubbed. The soundtrack benefits the most from the newfound clarity while sound effects often have impact in certain areas of the film. It’s a gorgeous presentation, leaving little room for complaint. The supplemental material includes another fine audio commentary by writer and film historian Troy Howarth, who covers the film’s history and its various cast and crew members with plenty of energy and good humor; Small World, a 29-minute interview with author and critic Michael Mackenzie, who discusses internationalism in the giallo genre, specifically the politics behind how films were made and released at the time; A Good Bad Guy, a 32-minute interview with actor Howard Ross about his career; A Study in Elegance, a 23-minute interview with editor Alberto Tagliavia about his work on the film; Inside the Yellow Pyjama, a 15-minute interview with assistant director Ferruccio Castronuovo about his work with director Flavio Mogherini; The Yellow Rhythm, a 21-minute archival interview with composer Riz Ortolani about the film’s score; a still gallery with 15 images; the original Italian theatrical trailer, presented in HD with English subtitles; and a 24-page insert booklet containing the essay “Stranger Than Fiction: Immigration, Alienation, and the Real Pyjama Girl” by Alexandra Heller-Nicholas, as well as restoration details. Not ported over from the Blue Underground DVD release is The Pyjama Girl Mystery: A True Story of Murder, Obsession and Lies, which is a 30-minute interview with author Richard Evans about the real-life case; the English theatrical trailer; and an 8-page graphic novel insert entitled “The Pyjama Girl” by Eddie Campbell. The Pyjama Girl Case is likely not a favorite amongst many giallo fans, likely due to its low body count and the lack of an overt style, but if you’re someone who has seen everything that the genre has to offer and you missed this one, it’s certainly different and most-assuredly worth your time. Arrow Video’s presentation is the best the film has ever looked, and with a nice allotment of extras, including Troy Howarth’s entertaining and informative audio commentary, it’s a worthy addition to any fan’s collection.